One of the challenges of living in the 21st century is dealing with the change. We can see changes we’d like to make: wouldn’t it be great if in the next generation people simply accept that humans are psychic? That we have the ability to connect with others on an energetic level? That we can heal ourselves? That we can connect with other invisible realms and spirits? Won’t it be great not to have to justify our belief in what we’ve experienced for ourselves, and try to prove it? Yet, while some changes seem appealing, when we experience changes we are often more afraid than relieved. Even with divination giving us glimpses into the future, sometimes it looks like we are headed for disaster with such force that nothing we can do can change it. There are many things we can’t change- like the weather * , so sometimes our choices are simply how to react to it, whether to change how we’re dressed or whether to take shelter. But along with those practical responses, we sometimes need to remind ourselves that we attract what we focus on, and our response can shape our experience. 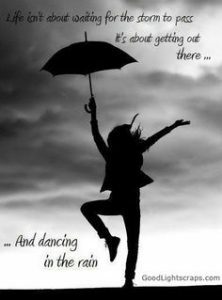 Sometimes, even if we can’t push the storm clouds along, we can dance in the rain, and focus on trying to change the way we feel about it to a positive one. Accepting that weather is one of the earth’s balancing systems, and maybe rain is a good thing- however inconvenient or uncomfortable- may help. These “interesting times” we’d rather not be living in may, in fact, be a blessing in disguise. As a healer, I remind myself of how a fever may not be just a symptom, but the mechanism by which an infection is cured. Others may prefer the analogy of the grain of sand which provides the impetus for the oyster to create a pearl. Probably every discipline can provide its own analogy. Many of discomforts we are now experiencing may be the mechanisms through which the changes we wish for are being accomplished. Our job is to look for those mechanisms and help them to our desired ends. Some of us remind ourselves that we chose to be born in these times, to be a part of these changes. Others take comfort that another, wiser force has put us here to give us the opportunity to make the best of this point in history. Or, you may feel (as Terry Pratchett’s “philosopher Didactylus it:) ‘Things just happen. What the hell.’” In which case, you may as well make the best of whatever opportunities present themselves, whether storm, drought or wonderful weather. Take what comfort you may. * yes, some of us do seem to be able to change the weather, but that’s a different theme! This entry was posted in Theme images Sundays and tagged blessing, chance, Dance, fever, Joy, pearl, rain, response, Terry Pratchett, weather.